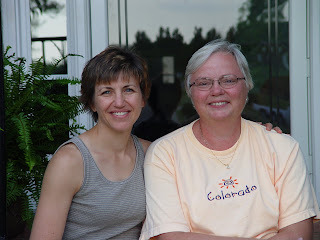 Mary was my side-by-side friend for almost 16 years; she was my neighbor in IL. Over the years, through side yard conversations while she weeded her impatiens beds, sitting at her kitchen table or on her screened porch with its swing eating cookies and sipping tea, borrowing that cup of sugar for a recipe, sharing the joys of raising boys, watching their dogs and they watching ours while each vacationed, and celebrating birthdays and holidays, we grew close. Closer than either of us knew, I think. Then I moved to Georgia. She's still waiting for me to move back. We talked on the phone yesterday for about an hour, and it was like no time had passed. I'm sure you have a friend like this. Someone who knows you so well that words aren't always necessary to explain yourself. Someone who will tell you the truth and provide great counsel because you've walked miles of life's road together and you have history. Someone who can be called no matter the time of day if you need something. At least I hope you have that kind of person to call your friend. After our phone call, I wanted to express how much her friendship means to me, and when I remembered that I have a new stamp set called Good Neighbors, I knew I had what I needed. This is a z-fold card, a 4.25"x11" piece of card stock scored at 2.75" and 5.5". The base is Sage Shadow. I wanted the card to show that we're close even though distance separates us, so I went online and traced outlines of IL and GA onto Post-It notes, then transferred those to card stock and cut them out. I used Apricot Appeal for IL, since it's a peachy tone Mary likes, and Barely Banana for GA because it's in the color family so I know it'll coordinate. I pulled out this clear mount stamp set and chose the house that looks the most like Mary's. She lives in an old 2-story wooden sided beauty with a wraparound porch. I stamped the house in Chocolate Chip and colored it with Ruby Red. I stamped the roofline I liked in Creamy Caramel. For my house, which is white, I went with Sahara Sand so that I could get the details that house stamp offered. You can see from the photo that the stamp is the same deeply-etched red rubber as the wood mount stamps. That means I'm still guaranteed the crisp images SU! 's stamps are known for. My roof is black and steeply pitched, so I chose one that I thought resembled it and stamped it separately from the house and cut it out. I mounted each house on its state. Then I wanted to create a "road" between our houses. There are three kinds of trees that come with the Good Neighbor set, so I hand colored them with my Stampin' Write Markers in Chocolate Chip, Old Olive, Always Artichoke, and Certainly Celery and lined the road between our houses with them. The sentiment comes from Whimsical Words, a set that's FREE with any purchase of $50 in merchandise during Sale-A-Bration, and it expresses what I want Mary to know. I stamped it on a paper "Kiss", a die cut offering from SU! in the Spring Occasions Mini: 20 for $3.95 (item #118779). I hope Mary will feel very appreciated when she gets this card. Love ya, dearheart! In local news, we have SNOW! We were feeling left out, what with all that the rest of the country has had dumped on them, so we're excited to be included in the Snowpocalypse of 2010! I was reading your comment on Stamp N Design about the Easter card, I love that one too!! I saw that you live in North Georgia, I do too, Hiawassee to be exact! I am going to become a Stampin Up demonstrator soon, I have been using Stampin Up for about 3 years and love it! Did you get a response about the Easter card? Take care and enjoy the snow, we got 4 inches Friday and are supposed to get 3 or 4 more tomorrow! MY card for Nina with NEW GOODIES!